Enum. Diagn. Cact. 11 (1837) nom. illegit. After producing several rounds of blooms earlier in the year it will give strikingly bright red fruit. This is a really beautiful cactus. 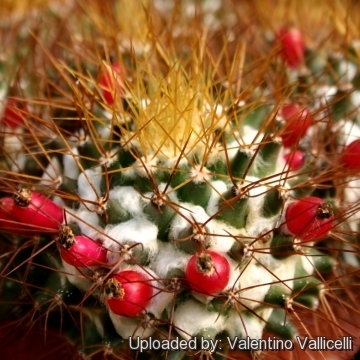 Origin and Habitat: Mammillaria nivosa has a wide distribution and is known from various locations on different islands in the Caribbean, the Bahamas, Puerto Rico (Mona, Desecho and Culebra Islands), US Virgin Islands (Buck Island, St. Thomas, Little St. James), British Virgin Islands (Tortola), Antigua and Barbuda, Cayman Islands, Jamaica, Turks and Caicos Islands. Habitat and Ecology: It has been reported from naked limestone rocks. Its habitat quality is expected to be declining due to urban and tourism development. Almost all of the islands where this species occurs are tourist resorts. However, this species also occurs on Mona Island, which is a protected nature reserve, and presumably not affected by development. 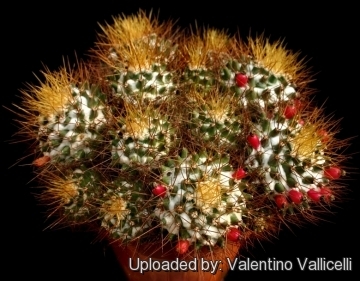 Description: Mammillaria nivosa is a colourful cactus species, solitary but usually offsets a lot (mat forming). Old and well developed groups up to 40 cm in diameter (or more). Stem: Globose to short cylindrical, dark green to bronze, 8 - 10 cm in diameter. With latex. Parastichy: 8-13, 11-17 and 13-21. Tubercles: Obtusely conical, laterally compressed. The axil is densely woolly. Radial spines: 6-13, straight and very sharp bright yellow to dark brown, to 20 mm long. 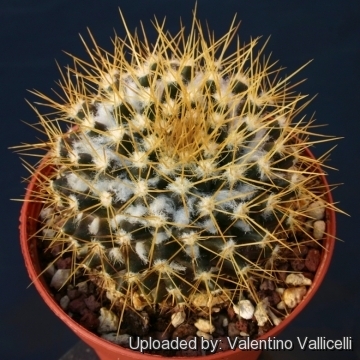 Central spines: Usually 1, similar to radials. Flowers: Diurnal 2 cm yellowish. Stigmas yellow. 1) Taylor, N.P. 2013. 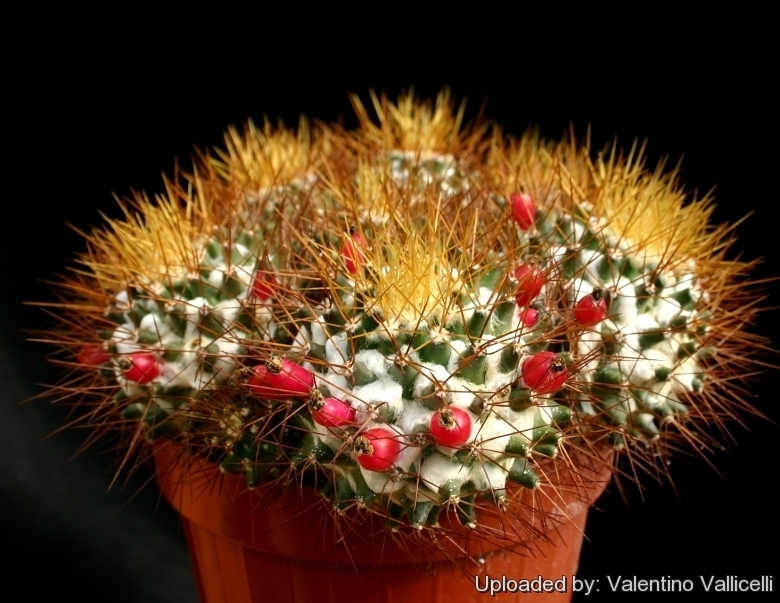 Mammillaria nivosa. The IUCN Red List of Threatened Species. Version 2014.3. <www.iucnredlist.org>. Downloaded on 31 January 2015. 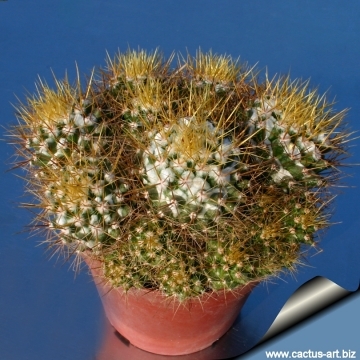 Cultivation and Propagation: The Mammillaria nivosa is an easy to grow tropical Mammillaria, that doesn't take any frost. Growth rate: It is a relatively rapidly growing and easily flowering speciesthat will make large clumps given the best conditions. Most plants will offset readily, and clumps can be produced in a few years. Soils: It likes very porous soil with a fair amount of organic matter. Watering: Water regularly in summer, but do not overwater (Rot prone), keep dry in winter. However it needs more water than its Mexican relatives and seems to tolerate moisture around the roots somewhat better than most species. Hardiness: Tender. Avoid any frost. Reputedly sensitive to low temperatures, but less so if kept on the dry side prior to, and during, cold weather. Warmth throughout the year will increase the grower's success. Exposition: Outside full sun or afternoon shade, inside it needs bright light, and some direct sun. Subject to sunburn if exposed to direct sun for too long. Tends to bronze in strong light, which encourages flowering and heavy wool and spine production. - Rot: it is only a minor problem with mammillarias if the plants are watered and “aired” correctly. If they are not, fungicides won't help all that much. 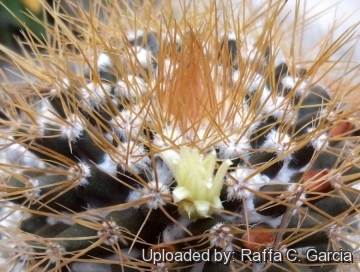 Warning: It has very sharp and hard spines. You should use gloves or wrap the cactus with thick newspaper. They may make it easier. Propagation: Division, direct sow after last frost. Seeds germinate in 7-14 days at 21-27° C in spring. To make a cutting twist off a branch and permit it to dry out a couple of weeks, lay it on the soil and insert the stem end partially into the soil. Try to keep the cutting somewhat upright so that the roots are able to grow downward.